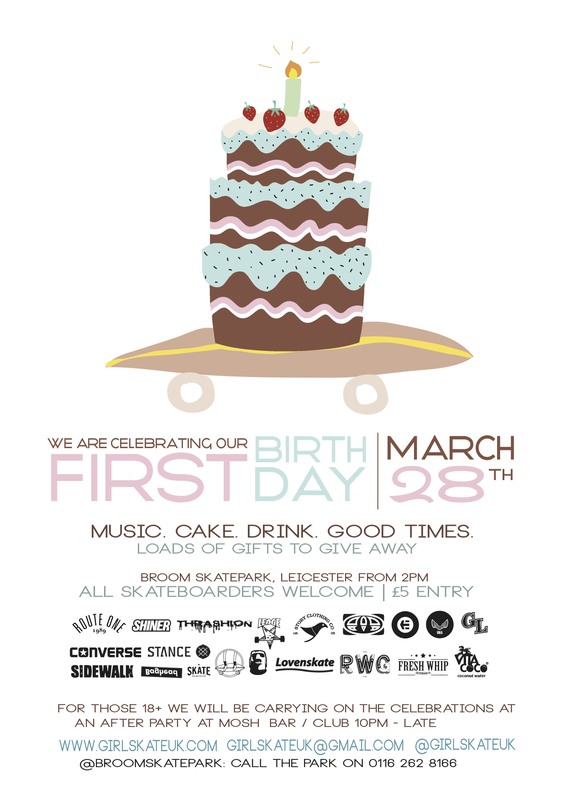 Our very first Birthday Jam is THIS SATURDAY, just TWO DAYS away and we can not wait! Held at Broom Skatepark in Leicester from 2pm – you can expect fun little competitions throughout the afternoon, a chill out area upstairs playing a selection of our favourite female skate parts of all time, a big homemade piñata, lots of friendly faces and a totally buzzing atmosphere! We’ve got a TONNE of product to give away all day from our sponsors below…. We’ll also have a little stall full of tshirts which will be available for you to buy on the day, a DIY popcorn machine so you can help yourself to freshly popped corn in between skates and loads of free cake and beer on a strictly first come first grab basis!! An after party will ensue at Mosh nightclub in Leicester town from 11pm so bring your dancing shoes! Loads of us are staying in the nearby Holiday/Premiere inn’s so don’t forget to book yourself somewhere to stay if you are traveling from outta town!